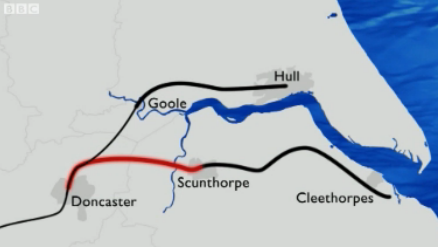 The rail line between Doncaster and Scunthorpe has been closed after the track was dramatically shifted when an "enormous" spoil heap at Hatfield Colliery at Stainforth, South Yorkshire pushed the track to one side. The track is still moving and the line is expected to remain closed for at least eight weeks. 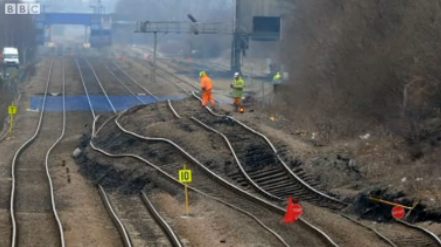 Rachel Lowe from Network Rail said: "This is an absolutely enormous task. We will have to re-lay the whole area. It is now placing local power supplies in danger too. There's thousands of tonnes that are still likely to move, so current unofficial speculation is it might be June or July before trains are going along there again.